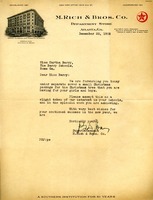 Letter from Martha Berry to Mrs. Frank R. Abbey in appreciation of her gift. 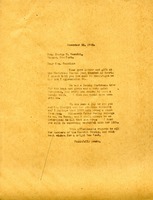 P. H. Jown of M. Rich & Bros. Co. writes to tell Martha Berry about a Christmas package they have sent for the Christmas tree at The Schools. 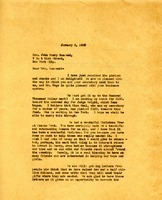 Martha Berry writes to Mrs. Nesbitt thanking her for the letter and gift which "just touched my heart." She also says that it was a joy to see Mr. and Mrs. Nesbitt and that she hopes 1929 will also bring a visit from them. She says that she will always be interested in what Elizabeth Faith does. 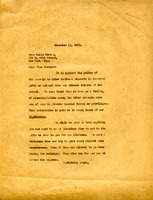 Letter to Martha Berry from Sears, Roebuck, and Co. In this letter Sears, Roebuck, and Co. tell Martha Berry that while they would like to help by donating merchandise for the Christmas tree, that they cannot because they get so many offers nationwide, and by donating to everyone that asks they would have to raise prices.